I sometimes envy parents who get to go to work, and socialize with adults on a daily basis. But then I look at my sweet baby's face ( I know, I know, age 2 is not a baby anymore) and love what I do even more. I know that I am very fortunate to have been able to stay at home with my children in their younger years. I'm sure there are plenty of parents who wish they could, but for some reason or another, are not able too. I realize what I have going for me is special. So what exactly do I do? Every person who is a stay at home parent does it differently, but I'm positive it's not just as simple as them staying at home while their kids/spouse are at school/work. You know all those demographic questions on forms that need to be filled out that ask your occupation? I just keep it simple and click "Home-maker" or Stay-at-home parent", because, well, it's just easier. I sometimes feel frustrated though because of the stigma that some people put with the phrase Stay At Home Mom. Long gone are the days of moms staying home "watching their soaps". As far as I see it anyways, stay at home moms do so much more than meets the eye. Business portion aside, staying at home gives me opportunities to get a lot done. I am able to handle all of the kids doctor appointments by myself. I think there has only been one, maybe two times that my husband has had to take our daughter to an appointment because I could not. Also, if the kids are sick, them staying home isn't a headache for my husband or myself to "call out of work" because I'm already here. I am able to handle all the grocery shopping, dropping off and picking up the kids from school, errands, present organizing, cleaning, phone calls, cooking, etc. Ok, Ok, I know my husband will read this, so I'll admit my cleaning and cooking may not get done as much as we'd both like, but with three angelic cherubs (laying it on there huh? ), sometimes I get a little behind. On top of all the SAHM duties, I try to help out, at least a little, financially, so I have my business as well. This includes, fulfilling my crochet orders, making inventory, creating/writing patterns, and blogging. Things that people may not realize is how much time this all takes. I'm not just sitting here crocheting and typing all day. I also have to continually find ways keep my FB fans engaged, stay active with my Pinterest board, work on my affiliate ad placements, and all the while studying ways in which to make my social media presence stronger. It's not like I have a nice quiet office to do this either. Like I said, I'm a stay at home MOM, so I have my youngest home with me all day, and let's just say, he's not as helpful as he thinks! As we all know, toddlers need attention, and if you don't give it to them for a second, they will call you on it. I may have a lot on my plate right now, with every second of the day being pretty busy, but I love it. So much truth in this. My husband doesn't understand that I envy him getting privacy to work. Right? 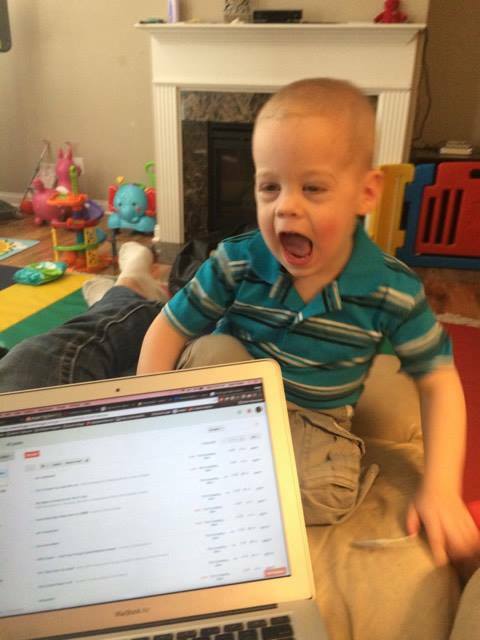 I mean, I like being able to work in my pj's, but conversations with a toddler tend to be one sided! Its awesome that its worked out do well for you! I think the most important thing is finding what works! I couldn't wait to go back to work after my 2m maternity leave. N i ve been working since! And i looove it! I love how everyone is so different, makes us all unique! Love it! Ny sister is a stay at home mum and i tell her all the time how lucky i am that i dont have to do that job! I dint think i could handle that! People truly dont understand how difficult it is. I think the hardest part is just the planning an organizing. There's a lot of stuff to fit into a short amount of time! It's the greatest. I feel very lucky. I agree there is so much more than meets the eye to a shams day!! Being a work at home mom has its advantages! I wish I could get an hour to myself in the mornings, but my kids always wake up when I try to sneak up early. They must have some sort of sensor on me..
LOL my 4 year old is up by 6 usually, but she knows that if she gets up she has to go watch a show on the iPad so Mommy can work! I have friends who both work from home, and they have to do all their work in the middle of the night when their kids are sleeping! At least during the summers anyways. I am a working mom, but in my maternity leave realized there is more staying home than meets the eye. And for running a business, the crochet and typing is the fun part (although itis only a hobby for me at this stage), building a social presence and all the behind-the-scenes work is hard and takes a lot of time to learn. Honestly, I wonder how working moms do it some times. All the work I have, PLUS going to a full time job? Moms are just amazing. As a currently stay at home mum who is also trying to blog a little on the side I understand that last point so well - you really only have nap times as toddlers do not appreciate you staring at a computer screen, haha! I can't imagine trying to run a business too, you do so well! No they don't! I don't know about yours, but my son thinks its a game to come close my laptop if he sees me opening it! You're so right. I can't believe my oldest is almost 9! Where has the time gone? 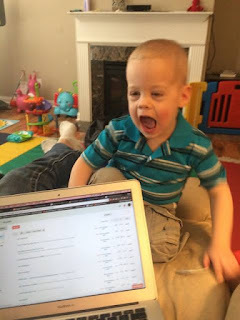 I'm a sahm who blogs as a sided hustle, and that balance is hard! I agree, but it's worth it in the end isn't it! Love this post. I blog as a side hustle but the dream is to work from home full-time. I'm under no illusions as to how difficult it will be! Not just pyjamas and Netflix like most people think! It's so true! I mean, we may be more comfortable at home, but it's not like we're just relaxing all day! This about sums it all up! And my oldest only has about 4 weeks left of school before he's home all summer, so it's going to get even crazier around here! But I love it! Yesss!! My almost 8 and 5 year old only have a couple weeks too. NOOOOOO..LOL I've been stocking up on some posts so I can spend their summer with them outside!! "I sometimes envy parents who get to go to work, and socialize with adults on a daily basis. But then I look at my sweet baby's face ( I know, I know, age 2 is not a baby anymore) and love what I do even more. " I taught for 3 years, one year I was part-time while my oldest was less than a year old. I hated it, even though I absolutely love teaching. I'm home now and have two under three. I love being home, even if I do miss teaching sometimes. I'm actually looking into going back to work now, trying to get a teaching job! My youngest is 2.5 now, so I feel like I'm ready! Stay at home mums are definitely NOT just stay at home mums, there is so much more to it and a little appreciation goes a long way! For me the best time for peace and the ability to get things done is super early before anyone else has woken! I love that time, a good cup of coffee, maybe a little pandora. Then I get on the computer and start my work! 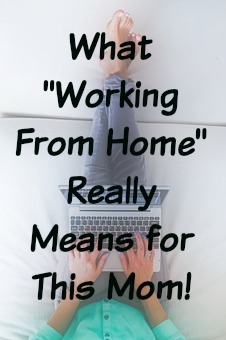 Very insightful not only for moms working from home but for anyone working from home. I know sooo many bloggers that asked for time alone to work for Mother's Day! WAHMs never get a break, and when they do, they're judged for going out on their husband's dime. I work outside the home, and I'm furious for the WAHMs. I am lucky to get to work and socialize with other adults during the day but to see my kiddo when she leaves school. Best of both worlds for me! Exactly! I love staying home with my son, but sometimes, I would just like a little bit of quiet to work! He makes up for it by being cute and giving me cuddles though.